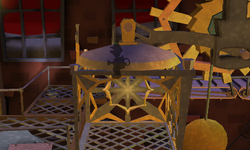 The Gear Chamber is a room inside of the Old Clockworks in Luigi's Mansion: Dark Moon. The Gear Chamber is only accessible by taking the door on the right inside of the Service Elevator. This is a large room with two floors. On the first floor, as the name implies, there are several gears turning a conveyor belt as well as operating the large scale in the middle. There is a hole in the wall that Luigi can look through by the scales to see a Greenie and the Strong Sneaker trying to hide the rotor. Another Greenie blocks the hole before Luigi can figure out where they hid it. On Floor B1, there is just a large area of sand and several crates. On the first floor, the door on the left takes Luigi back to the Service Elevator while the door on the right leads to the Storage Room. On Floor B1, the door to the left takes Luigi to Floor B1 of the Service Elevator while the door on the right leads to Floor B1 of the Storage Room. A puzzle with the balance in the room. During Piece at Last, the Gear Chamber is one of the rooms Luigi must go through to reach the Toad in the Synchronization Room. When Luigi takes the scale to go down, it becomes stuck, meaning Luigi cannot go back the way he came. The Strong Sneaker with the rotor also disappears into the Storage Room. After rescuing Toad, when Luigi comes back to the Gear Chamber, he is attacked by the Strong Sneaker. Before Luigi can fight the Strong Sneaker, he must fight three normal Greenies, three Greenies with shovels, three Greenies with paranormal shields, and three Mummy Greenies. After this, Luigi can capture the Strong Sneaker. On the first floor of the Gear Chamber, Luigi must shoot Toad into the scale on the right. This tilts the elevator and allows access to the Storage Room. After pillaging the Storage Room, Luigi must go through the conveyor belt behind the scale to go back to the Service Elevator room and send the Toad assistant back to Professor E. Gadd. Only during Piece At Last, Luigi should make his way to Floor B1 of the Gear Chamber. On the right side, there are several stacks of crates and a gap in between. Shining the Dark-Light Device on this gap reveals a missing piece of wood. After capturing the Spirit Ball, Luigi can walk across this wooden plank to come across a door that is shaking violently. Entering the door takes Luigi to a Bonus Challenge where he has to collect eight Red Coins in fifteen seconds. If Luigi manages to accomplish this task, a Treasure Chest with a ruby appears. This page was last edited on May 24, 2018, at 16:09.